Phase 6 Copy EditingThis is the awful one and I always forget just how awful. Foolishly I look forward to having the "baby" back. I also suffer from the illusion that I have submitted a manuscript that is in perfect shape. My illusions are shattered with amazing speed. 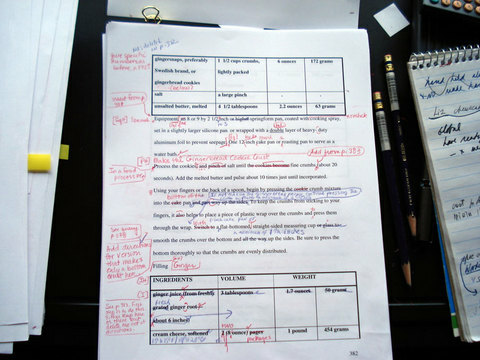 Take a look at a sample of a copy edited page and you'll begin to understand what the author is up against--especially the author of a cookbook and most especially the author of a detailed baking book. The production editors notes are in grey pencil, the copy editor's in red, and mine in purple. It is at this point of the book production that I start to imagine opening the window and jumping out. Elliott told me several books ago that jumping from the seventh floor is a poor idea and the truth is I love life far too much for this to become a reality but the image does present itself to me as I struggle through addressing the queries--flipping back and forth between the close to 700 page weighty manuscript, trying to remember why I did what I did and being careful not to change something that may not be consistent but may actually be an exception and needs to be inconsistent. Escape is what I looking for. Of course all of this will vastly improve the book. But the reason it is such a desperate process is that for the sake of consistency and accuracy, it needs to be done without interruption in order to retain all the necessary information. Friends and relatives knew not to call. And Elliott understood. It took 11 days and nights of steady scrunity to go through the whole manuscript and I pause now between reformatting three recipes into chart form (I thought I could get away with a simpler approach for a 2 ingredient recipe but it's not consistent with the rest of the style) and the start of a total read-through. I pause to write this before I forget once again.... Tedious as a full read-through is, reading out loud one hears words in a different way and it will also give me the chance to see if the changes the copy editor and I made are legible and comprehensible for the person who will input all these changes electronically. Ah ha--you guessed--that is part of the "opening the window" temptation--the thought that after all this work things can go very wrong unless proofed all over again and even then...This is why I promise myself each time to write shorter books. Despite all this anxiety and immobility (sitting for so many hours is just not healthy) I feel blessed to have the opportunity to do a book of this magnitude and quality. And I feel doubly blessed to have the support and encouragement of Ava Wilder, head of production at Wiley who cares so much about all these details. And triply blessed to have Deborah Weiss Geline as the most amazing copy editor of all time. Not only is she ruthlessly thorough (she even Googled many of the entries!) she has years of publishing experience behind her including being a senior editor at Artisan books. I kept marveling at how she could endure spending the two months she was given to go through so much detailed material. But as Ava so wisely pointed out in a loving and encouraging e-mail to me: Let's see if this helps you as you work so hard on the manuscript. Writing, which we often forget, is a very lonely pursuit, and it is only natural that you feel lonely poring over the manuscript for the hundredth time. Editing and revising are especially grueling and we all feel their discomforts. But in the end, when the reader picks up the book, it is such a wonderful thing to be able to offer an experience that is pure pleasure, free of frustration, confusion, or irritation. It is going to feel like your generosity and caring radiate from the pages. So, all this work will be very much worth it in the end. Remind yourself that your books are very ambitious endeavors, so big, filled with charts and accurate measures, and the recipes tested so many times... Here is a quote I heard once and always remember: Patience is bitter, but its fruit extremely sweet. Back to Debbie, I can't resist mentioning that she is very beautiful--tall, slim, blond, with blue eyes and a calm, gentle disposition. I made her wedding cake years ago as a present (which will tell you how I felt about her even then) when I was an author at William Morrow and she was a copy editor. Sadly I have no photos of it or of her or I'd be posting them but I do remember that the white frosting--actually it was probably rolled fondant--was covered with little silver stars I cut from thinly rolled fondant brushed with edible silver. I chose silver because my image of her was of moonbeams and light. So what happens next? I will hand Ava the manuscript at our book design meeting in two weeks as I don't trust any other delivery system. There probably will be discussions about some of the changes I made or rejected and then the inputter goes to work integrating them. I don't get the manuscript back again until December when it goes into "pages." I expect I'll be spending the holidays proofing them against the copy-edited manuscript as mentioned before. Meantime, we have the rest of the photos to take and the DVD to make.